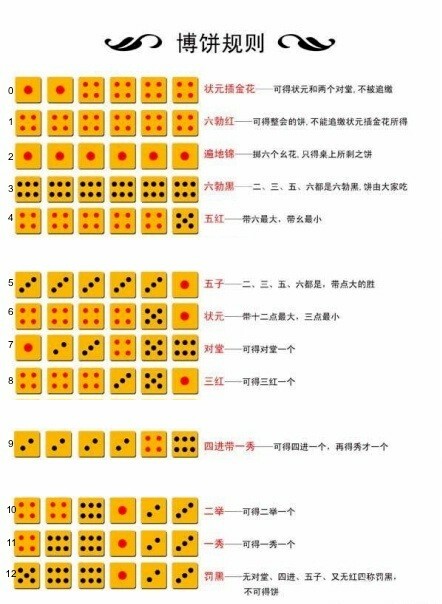 Tomorrow is the Mid-Autumn festival, and in the spirit of that holiday, I will introduce a gambling game that we (people from Xiamen) play during the holiday! I guess only Chinese people can do this challenge! Okay, fine, here are some English explanations. 0: 4 fours and 2 ones. 3: 6 of any kind except fours and ones. 5: 5 of any kind except for fours. 9: 4 of any kind except 4. Your program/function may return/output anything to indicate the rank, as long as each rank is indicated by one output and vice versa. Ex. Using the numbers 0-12, 1-13, etc. 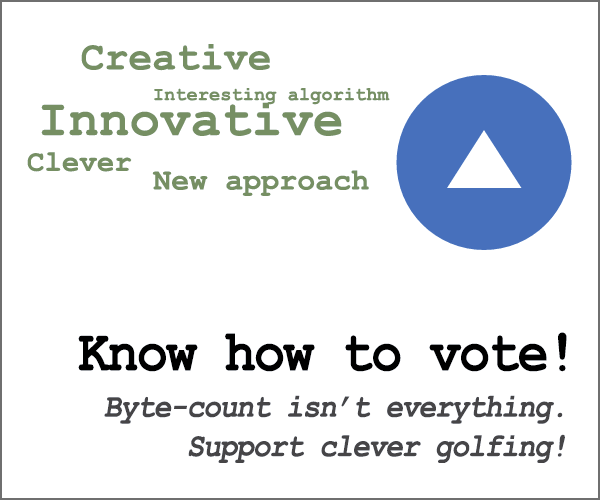 This is code-golf, so shortest byte count wins! Calculate the highest frequency of any digit. If there is a 6 of a kind, then subtract the position of the digit in the string 14 from 2. This results in 1 for 6 4s, 2 for 6 1s, and 3 for 6 of anything else. If there is a 5 of a kind, then the result is 5 unless there are 5 4s, in which case 1 is subtracted. If there is a 4 of a kind, then if there are 4 4s then the result is 6 unless there are 2 1s in which case the result is 0, otherwise the result is 9. If all the digits are different then the result is 7. Otherwise the result is 12 - (4 >> (3 - # of 4s)). Try it online! or Test all possible rolls! When \$F=4\$: we use a special bitmask \$4b\$ when the two other dice are 1's, or a default bitmask \$4a\$ otherwise. When \$M=6\$: we use a special bitmask \$6b\$ when we have a six-of-a-kind of 1's, or a default bitmask \$6a\$ otherwise. Valid combinations of \$F\$ and \$M\$ are highlighted in bold and blue in the following table. All other combinations (in gray) can't possibly happen. For instance, if we have three 4's, we must have \$M\ge3\$. But because there are only 3 other remaining dice in such a roll, we also have \$M\le3\$. So, there's only one possible value of \$M\$ for \$F=3\$. There is another \$7\$ in the table, but it's invalid. Therefore, a straight is uniquely identified by \$7\$. Encode the score as a bunch of indexed conditionals. Simpler than my first stringy-regex approach. Edit- fixed bug and now rank all rolls. Maps to reversed rank, 0-12. Try it online here, or verify all the test cases at once here. 12: 4 fours and 2 ones. 9: 6 of any kind except fours and ones. 7: 5 of any kind except for fours. 3: 4 of any kind except 4. This works by mapping the dice values to frequencies, then calculating the value of several rules, and taking the maximum of the set. eS[   Wrapping it all up! -11 bytes thanks to @Neil. Port of @Neil's Charcoal answer, because my initial approach was already at 60 bytes and I wasn't done yet. My current answer can probably be golfed some more, though. Input as a list of digits. Count occurrences of every number in the array, prepend number of 1s and append number of 4s. After that, try to match with different regex patterns. Not the answer you're looking for? Browse other questions tagged code-golf game or ask your own question.